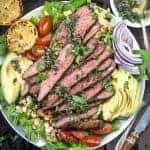 A simple and delicious recipe for Grilled Flank Steak marinated in a savory soy and rosemary mix. 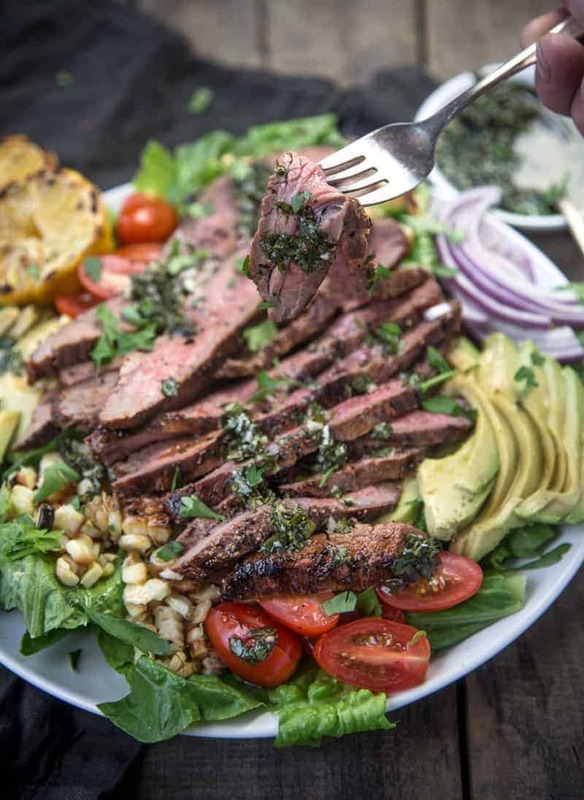 Perfect for a hearty Grilled Flank Steak Salad, or filling for a sandwich. You’ve gotta try this incredible and full flavored steak! We’ve been dusting off some old favorite recipes lately and giving them new life. Last week during unending sunshine and near perfect weather we decided to revitalize our Grilled Flank Steak Marinated in Rosemary and Soy. This is a recipe we created while on vacation several years ago in Hawaii with some good friends. We grilled on the beach while watching the sunset (pre-kids). Seriously, what could be better than that (besides adding a freshly made Mai Tai to the mix)? Since I won’t be going to Hawaii anytime soon (except in my dreams), we decided to recreate the meal. 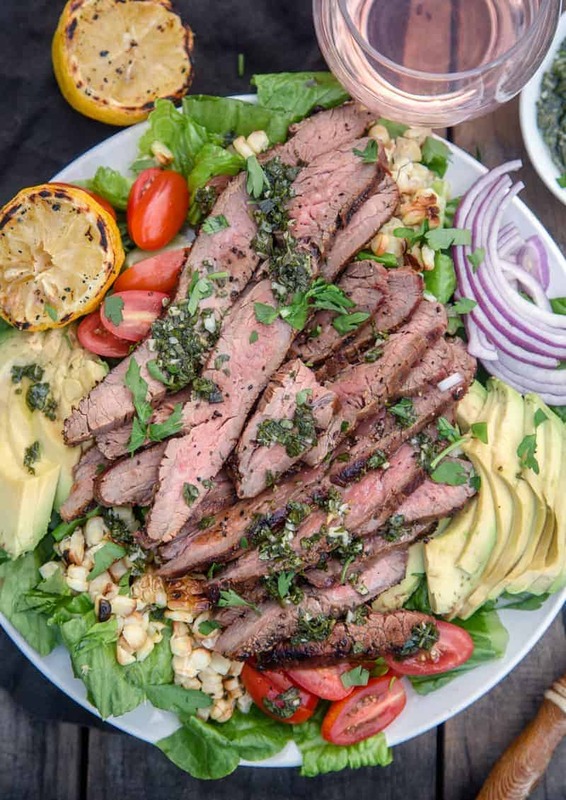 And instead of the sandwiches we originally created it for, we’re tossing the flavorful flank steak into a hearty salad perfect for summer when you want something substantial, but not too heavy. This is it, and it’s probably the only salad Sean will even consider as a full meal. Where flank comes from is similar to the general area of hanger and skirt. This relatively lean cut comes from the side, or flank of the cow near the back side abdominal muscle. Great for tacos, or slicing and having on its own. Hot and fast is the way to go, because it has so little fat. It is fibrous, or has very distinct lines in which you want to pay attention when you are done and cutting the meat. We like to add a little marinade, and then apply dry rub just before placing it on a hot grill for the sear. Usually done in less than 8 minutes (depending on the exact size of your steak). Taking temperature with a thermometer is key, as there will be a thick side and a thin side. 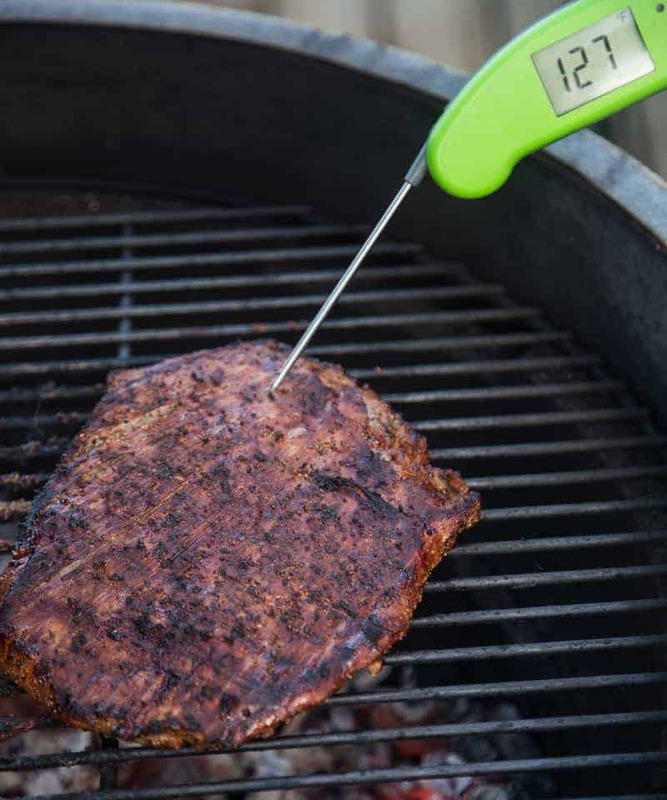 We go for a medium rare (130 – 135 F) and take the temperature with our instant read thermometer in the thicker portion of the flank. That way if you have fans of medium cooked steak, they can take from the thinner side, which will be more cooked than the thickest side. Take the temp after you have flipped. 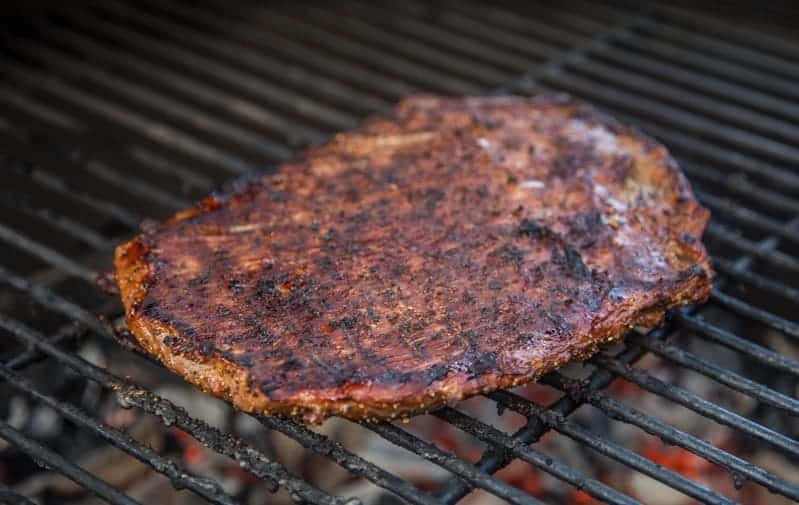 Pay attention to the lines on the steak, as you want to be sure you cut across the grains, this will keep the cells intact and make for a great tender texture as you eat it. The same technique applies for hanger or skirt (or really any steak for that matter). This is a super easy marinade and steak recipe. Make your dollar stretch by serving thin slices of the steak on small rolls or slider buns like we did when we first came up with the recipe years ago. Or, if you’re looking for a great summer salad serve it over the top of greens with your favorite fillings. It’s fantastic with some fresh onion (for acid and crunch), creamy avocado, sweet cherry tomatoes, grilled corn, and use chimichurri sauce in place of dressing. *Chimichurri sauce is one of my favorite substitutes for dressing with grilled meat. Just a tablespoon or so of chimichurri sauce adds such incredible flavor! Tip: while your meat is grilling, throw on some corn to the grill as a side or to your salad. Cut a lemon in half and add that to the grill too, until you see char marks. The juice from grilled lemon is incredible and will add great depth to your salad! 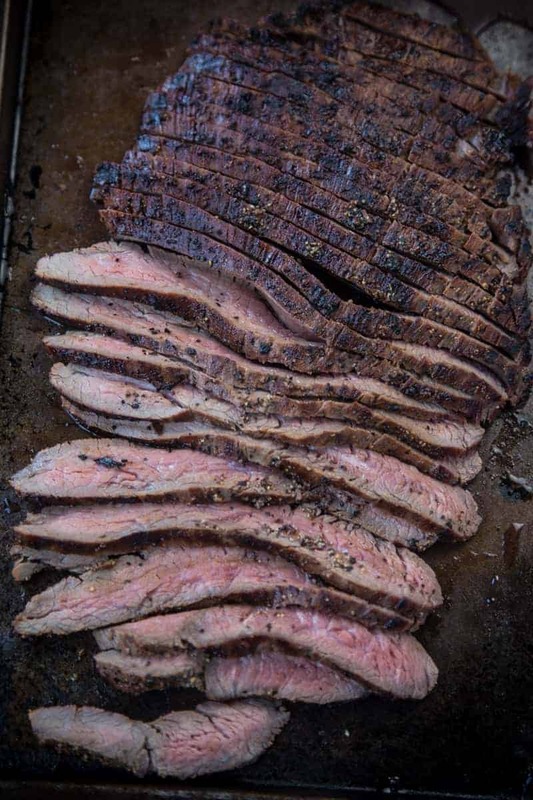 Grilled Flank Steak marinated in a savory soy and rosemary mix. Perfect for a hearty salad, or filling for a sandwich. In a large freezer bag add all the marinade ingredients and shake, combining all together. Warm up grill to medium high heat and remove meat from freezer bag. Sprinkle the meat with dry rub on both sides. Grill over direct heat for approximately 4-5 minutes on each side for a medium rare steak, but adjust time based on your desired doneness. Check temperature with a good digital thermometer for your desired temp. We aim for 130-135 degrees internal temperature. Remove from grill and let sit at least 10 minutes to allow juices to settle. Slice across the grain in thin slices and serve over a salad or as a filling for sandwiches. cherry tomatoes (about 1/2 cup), sliced red onions (1/2 onion), 1 avocado (sliced), grilled corn (2 ears), and use this chimichurri sauce as a dressing. Just 1-2 tablespoons per serving will sub for a salad dressing and add incredible flavor. I like a firm green for a base, like romaine lettuce. Tip: while your meat is grilling, throw on some corn to grill to add as a side or to your salad. Cut a lemon in half and add that to the grill too, until you see char marks. The juice from grilled lemon is incredible and will add great depth to your salad! If serving this alone, or as a sandwich I might reach for a savory red wine (Sangiovese comes to mind, or other fruity Italian red). But with this salad, with all of the other fresh ingredients, and herbaceous and acidic chimichurri sauce, I’m reaching for a rosé. Between the savory meat, bright chimichurri sauce, sweet corn, and creamy avocado, a rosé is one of the few that will stand up to all of those flavors. We recently had it with the 2017 Rodney Strong Rosé of Pinot Noir and it totally hit the spot! It added some bright and fresh fruity notes to compliment the grilled meat and sweet corn. It’s a tasty wine and perfect for summer grilling season, and bold enough to stand up to meat if I do say so myself! Want more great summer Steak Recipes? Love the tip to grill up some lemon for a bit of smoky acidity too! Plus, obsessed with all your salad topping choices! 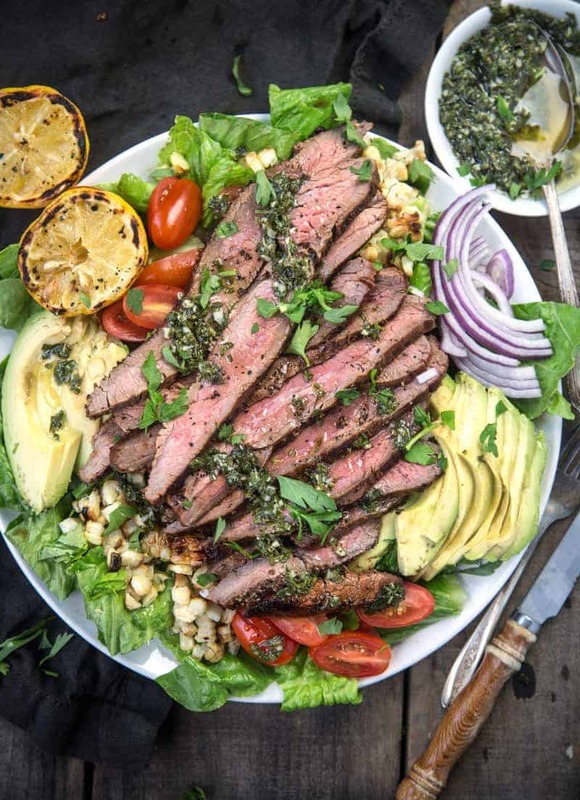 This is great how you recommend so many ways to use flank steak. It looks super versatile! OMG! Made this last night and served with the salad and your Chimichurri recipe and the family is still talking about it this morning! Only change I made was I doubled the garlic in the marinade because we LOVE garlic. This was the first time I’d grilled flank steak and also the first time I made Chimichurri. I also grilled the other half of the lemon and will probably do a whole lemon the next time… and there WILL be a next time! The Chimichurri recipe is perfect for us because you don’t use cilantro and that’s one herb we just don’t like. It’s so good, I’m going to make a batch to freeze up in ice trays to have on hand and I’m already looking for more dishes to use it on. John thank you so much for the feedback and so happy you enjoyed it! We love that you modified!